A Location in Tanda is the physical location of your business which houses the different Teams your Staff work in. Shift Details can be added to Teams to give extra information on the Roster to Staff about that Shift. Give your Location a Name such as the name of the business, the city or the suburb. Just keep in mind, if you have more than one Location and Staff are rostered to work at both, they will see this name on their Roster, so make it a name familiar to Staff. The Short code is an abbreviation of the Name used to easily identify it on the Roster. This will be automatically filled in, but can be changed by clicking in the field and updating. In the Address field, start typing and Google Maps will find the address, click to select the full address. This will be used for the Weather Forecast on the Roster! At this point you can click Create New Location at the bottom to save, or you can click Show advanced options... just above the save button, if you want to add specific Public Holidays and a Time Zone to this Location. Under the Advanced Options, you can set location specific Public Holidays and a Time Zone. This is used to configure the settings if the Location is different from the default in the account. The Time Zone was set when you first opened the account and selected where you are located. If this is incorrect, please contact Support on the details at the bottom for it to be updated. The Time Zone can be used so Rosters and Timesheets reflect the correct Time Zone for the Location. The Time Zone may already be populated, based on the Address you entered above for the Location. This takes you back into the setup for the Location where you can edit the Name, Short code, Address and Public Holiday and Time Zone setup. Just click Update Location Details at the bottom to save. If you need to remove a Location, if it doesn't have any Teams under it, you can just click Delete Location under the Edit Location options. There is further instructions provided in the Remove a Location or Team article. Team Name: give your Team a name. Staff will see this on their Roster, so it's best to make it a Name they are familiar with. Colour will automatically assign, so just click on the button to change colour. This colour will show on the Roster both in your Tanda account and to Staff. At this point you can click Add New Team at the bottom to save, or you can click Show advanced options... just above the save button, if you want to add Payroll Cost Tracking, Qualifications and Shift details. Qualifications: add Qualifications that staff must hold in order to work in this Team. For more information on how to set this up have a look at the Qualifications article. Shift Details: allows you to add an extra level of detail in the Roster, by placing them into roles in their shifts. This could be Manager, Shift Supervisor or Cashier. To add a new shift detail, type in the box and hit enter on your keyboard or click the + icon. This is then included in the Email or SMS to Staff with the Roster, letting them know what they're doing on a particular shift. Once you've finished, just click Add New Team to save. 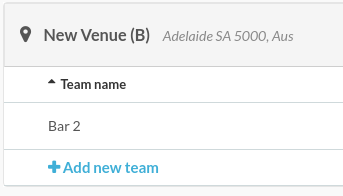 To add another Team, back in the Teams page, click + Add and select Team. This takes you back into the setup for the Team where you can edit the linked Location, Name, Colour, Staff & Managers, Payroll cost tracking, Qualifications and Shift Details. Just click Update Team Details at the bottom to save. To remove or delete a Location, you first need to remove any of the Teams within this Location.